This recipe for Morning Sundials can be prepped the night before. Just cut the grapefruit sections into one bowl and the orange sections into another. Cover both with plastic wrap, and store in the refrigerator overnight. 1. Using a sharp knife, completely remove the outer skin and white pith of the grapefruit. Hold the grapefruit over a bowl, and cut out the sections, letting them fall into the bowl. Cut the orange sections into a separate bowl. 2. On each of 8 (8-inch) dessert plates, arrange 6 grapefruit sections and 6 orange sections in an alternating pattern around plate. 3. 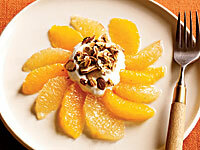 Spoon 1/4 cup yogurt onto the center of each grapefruit-orange arrangement, and sprinkle each with 1/2 tablespoon granola. Serve.